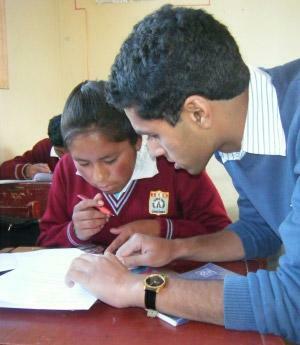 On this voluntary teaching project you will work at a primary or secondary school in Cusco. The Peruvian Ministry of Education is always looking to improve the standard of teaching. We work with them and local teachers to give them new ideas and ways of planning and teaching classes. 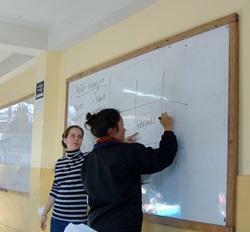 How can volunteer maths teachers help in Peru? Planning, preparing and delivering lessons to a range of classes. Designing and teaching 90 minute ‘model’ lessons to show staff different teaching methods. Holding workshops with staff to discuss issues raised during ‘model’ lessons. Observing classes in order to assess existing teaching staff, offer advice and set goals for their development. Organising and running training clinics for Projects Abroad volunteers working with other schools (optional). This project is designed for teachers who have intermediate spoken Spanish. This will help you engage with staff and pupils. We work with secondary schools with pupils aged 11-18 and class sizes of around 30-35. We have an extensive set of teaching materials available for you to use. This project runs all year round so you can join at any time. During the summer holidays (January to February) this project runs as a teacher training school. You decide how much time you can spare and we will help you get the most out of it. This project has a huge amount of peer contact because most of your work will involve interacting with Peruvian teachers. You will be able to learn from their methods and pass on tips from your own experiences. You will also gain experience of teaching children in a foreign language and finding new ways to simplify and communicate ideas. Through educating the children at the school, you will learn about Peruvian culture and way of life. Staff and pupils will want to hear about your life back home and your family and friends. We call this ‘cultural exchange’ and we think it helps our volunteers gain a new perspective on life. Safe accommodation with an Peruvian family close to your project. If you have attained Qualified Teacher Status (or the equivalent qualification in your home country) then you are perfectly suited to this project. You will also need to speak Spanish at an intermediate level.